Enamel is a transparent white substance that is the hardest and most mineralised substance in the body. Enamel is the outermost layer of the teeth and the exposed area in the mouth. It is our teeth’s natural protection against plaque, tartar, cavities and dentine hypersensitivity. Teeth, like the bone tissue of vertebrates, are made of a natural composite material in which the main component is inorganic “hydroxyapatite carbonate”, which makes up 65-70% of dentine weight and over 90% of enamel weight. Dental enamel is the thin outer surface coating on our teeth and is considered to be the strongest and hardest biogenic material. Dental enamel is mainly made up of large prismatic crystals of hydroxyapatite with a high degree of crystallinity and a very low percentage of protein. Under normal dental conditions, hydroxyapatite in the enamel and dentine is divided into high-intensity and hard layers that guarantee the integrity of our teeth. 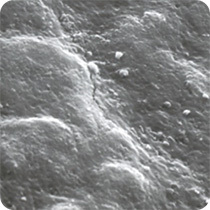 A lack of hydroxyapatite, and the mechanical and chemical wear and tear caused by external factors such as brushing and food sugar acids, lead to the demineralisation of the dental enamel that causes damage and creates micro-scratches that are invisible to the naked eye, which is the optimal micro-environment for bacterial growth. Our teeth are damaged by many factors every day. 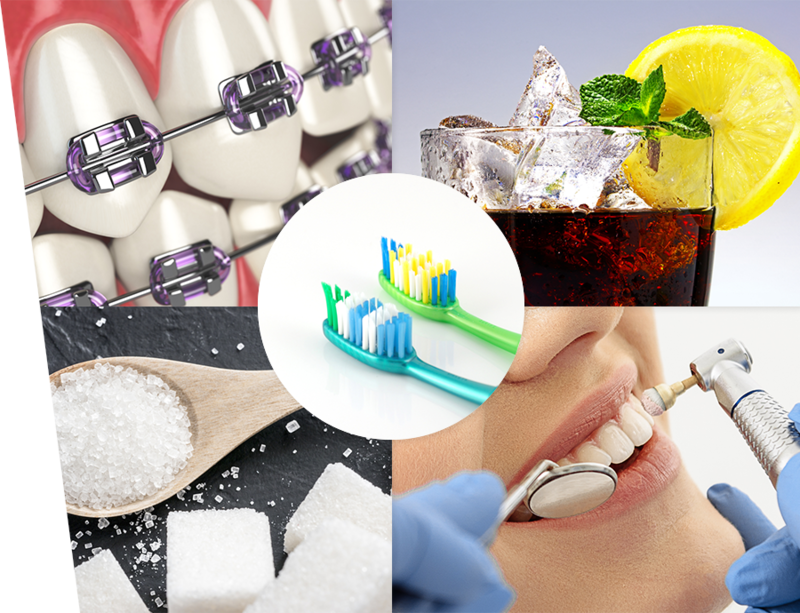 Eating acidic or sugar-rich foods, grinding our teeth, professional teeth whitening and the use of braces contribute to the formation of micro-scratches on the surface of the enamel and dentine that are invisible to the naked eye. The enamel and dentine deteriorate and demineralise. Enamel erosion is progressive, even in people who have a healthy diet and good oral hygiene. 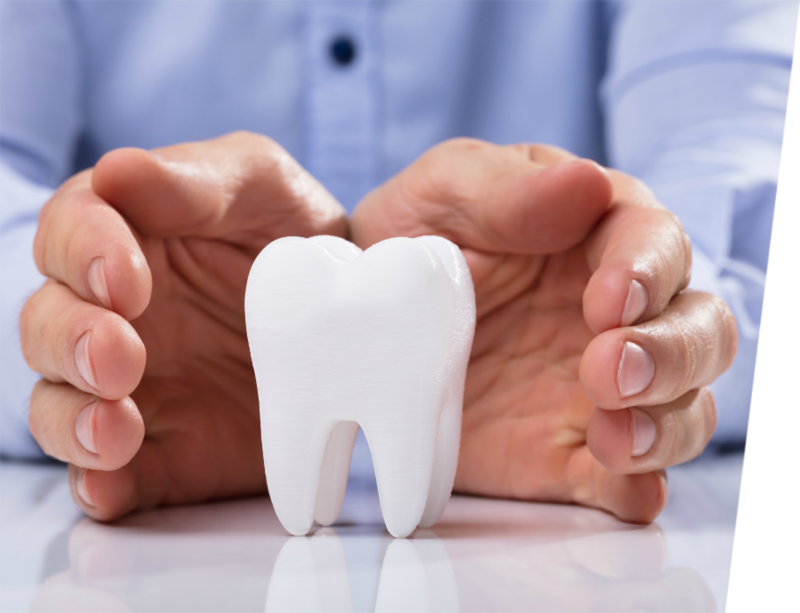 Although invisible and asymptomatic in the initial stage, enamel erosion can worsen and affect the look of your smile and lead to symptoms, such as dentine hypersensitivity and cavities and even more serious tooth fractures. The body uses the carbon dioxide present in our breath and the water in our saliva to create carbonic acid that dissolves the minerals that bind to the hydroxyapatite of the tooth, thereby naturally remineralising it. However, natural remineralisation is often not enough to keep our enamel strong, while the demineralisation is exponentially accelerated by eating sugar and refined foods. Additionally, the enamel of adults contains no cells and therefore cannot regenerate. Any damage is irreversible as there is no biological process capable of repairing the damaged enamel. Dentine exposed to the mouth cannot be regenerated either, as the deposit of new dentine occurs on the inner surfaces of the crown, i.e. close to the dental pulp and not on the outside. A few day-to-day tricks help to prevent enamel erosion. For example, the consumption of acidic food and drinks should be reduced. Brushing your teeth after eating helps to maintain the natural pH of your mouth and reduce erosion due to acids. It is important to brush your teeth with toothbrushes that have soft bristles that are gentle on enamel to prevent mechanical wear. It is also a good habit to regularly visit your dentist or dental hygienist for dental check-ups and to have enamel care explained to you. 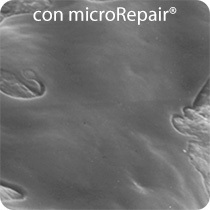 For over 10 years, Biorepair® has been taking care of dental enamel. Biorepair is the only toothpaste in the world that contains new enamel in the tube for your teeth, thanks to the biomimetic microRepair® molecules. Other toothpastes cannot boast this innovation: in fact, they contain ingredients that could only be recreated in the mouth under certain difficult conditions. 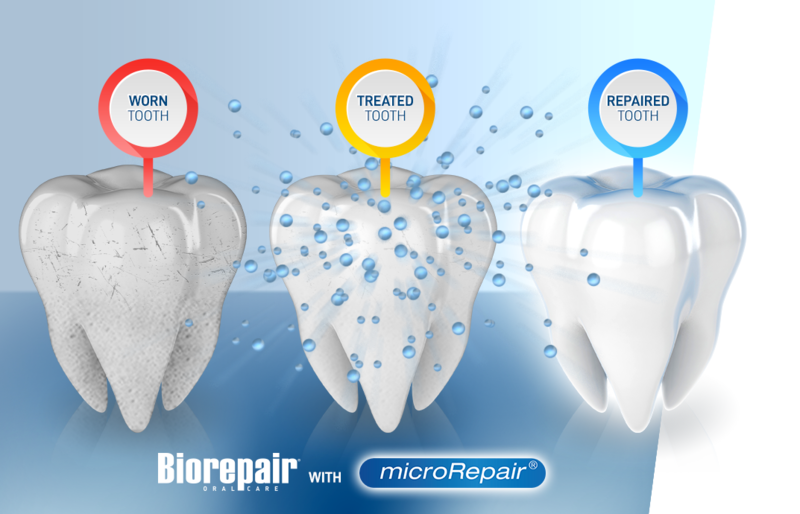 Moreover, with Biorepair, when cavity-causing bacteria attack your mouth, you are immediately protected: it is the new enamel deposited by Biorepair on your teeth that is attacked first and the microRepair® is able to instantly respond to the attack by releasing zinc, a natural antibacterial substance that fights bacterial plaque. No other toothpaste in the world does this! The effectiveness of Biorepair has been demonstrated with scientific tests at the University of Bologna and by external institutes. Studies have also been published in prestigious international scientific journals.